The Ritz-Carlton – probably the most updated and modern of the three I’m listing here, The Ritz-Carlton in New Orleans exudes luxury. Beautiful rooms, a lavish courtyard, and an expansive, comfortable bar/lounge are just a few things you’ll find here. There are also fun little perks guests can enjoy like free Gumbo at 5pm (served from a little cart in the lobby) – who doesn’t love that?! It was delicious, in case you were wondering. 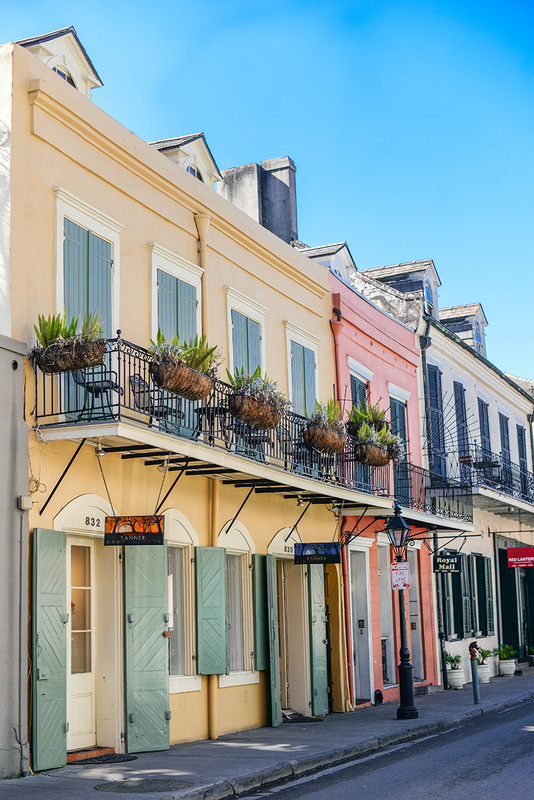 Windsor Court – if you are hoping to stay away from the craziness of the French Quarter, book your room at Windsor Court, which is located in the Central Business District. I didn’t see the rooms, but the lobby is beautiful, there’s a full-service spa and fitness center, etc. You can also enjoy classic cocktails and live jazz at The Polo Lounge bar, a local favorite! 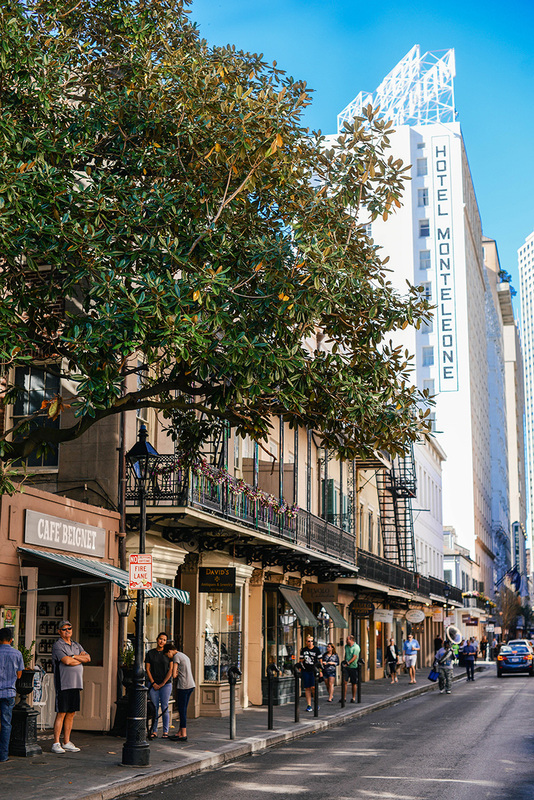 Hotel Monteleone – if you’re looking to be in the thick of it all and in the French Quarter, reserve a room at Hotel Monteleone. This stylish hotel is one of the last family-owned hotels in New Orleans, and is a historical landmark, having been around since 1886. In addition to luxurious rooms and a prime location, the Carousel Bar downstairs is a fun and festive spot for meeting up with your friends before or after dinner! R’evolution – if you’re looking for a date night spot, you should have Restaurant Revolution on your list. Grab a drink in the beautifully dark bar before being seated in one of the cozy booths inside the restaurant. The service and food are both outstanding! 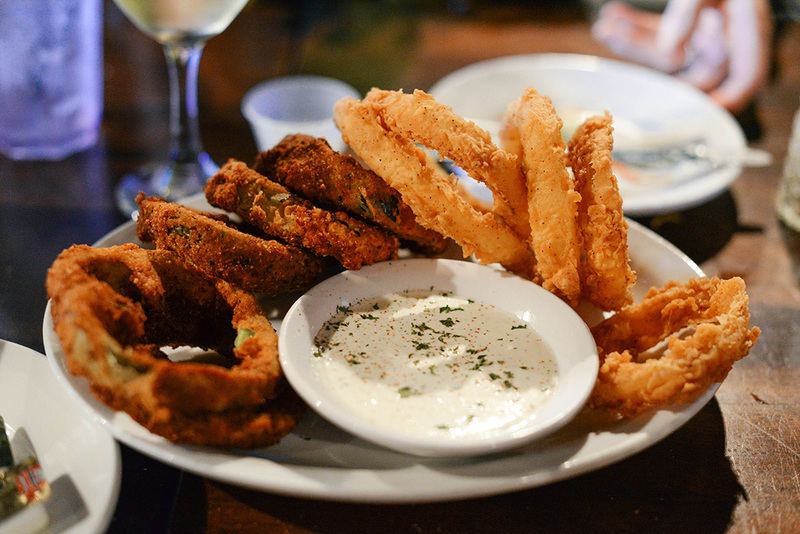 You absolutely have to try the Crab Beignets – they are positively sinful. Antoine’s – we had reservations at Antoine’s on our first night in NOLA! It’s a local institution and is known for being the oldest restaurant in the city. The menu is extensive! Featuring items like oysters Rockefeller, soft shell crab, a variety of fried and grilled fish dishes and more. There’s also poultry and beef for those not into seafood! While the food is definitely delicious, the ambiance and New Orleans feel of this place is what you go for. Insider tip: try to get a table in the red room at the back of the restaurant. This is where they seat the locals and frequent visitors! 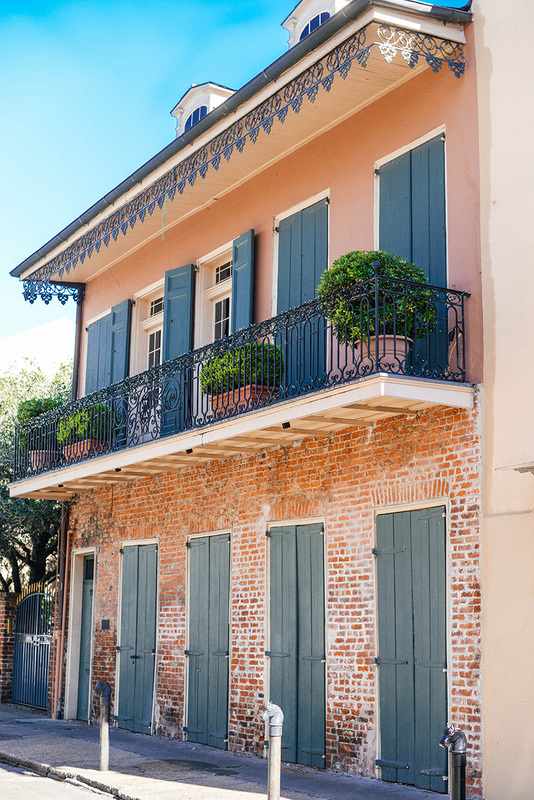 August – just across the street from Windsor Court is the popular John Besh restaurant, August. The menu is much more limited than the other restaurants on this list, but sometimes that makes it easier to make a decision! I highly recommend the potato gnocchi with black truffles for a starter – I wish I could’ve gotten an entire plate of that for my meal. It was incredible. For my entree I had the pork, which came three ways: jowl, rib and loin. So rich and delicious! Galatoire’s – another New Orleans must-visit is Galatoire’s, which just so happens to sit right on Bourbon Street! This historic spot is another one that you go to for the ambiance. The food is amazing, but it’s the old world New Orleans personality and service that really makes the experience! For your entree, you basically create your own dish with various fish and meat options, you choose a sauce, and several sides. Our waiter, Skip, recommended blackened red fish with lemon caper beurre blanc sauce, so that’s what I ordered – it was to die for! Frankie & Johnny’s – if you saw my snaps from this restaurant you probably won’t be surprised to find this was my favorite meal of the trip. From deep fried bell peppers (OMG!) to huge fried shrimp platters and fries topped with cheese and “debris” (super tender shredded roast beef), I ate my little heart out. This spot is a hole in the wall in the best possible way. If you’re looking to blow your diet, this is the place to do it! Willa Jean – my sister and I had planned to grab brunch here until we discovered the wait time upon arrival. We went to Commander’s Palace instead, which was good, but it felt like a tourist trap (and it took forever to get our food!). Unfortunately we didn’t get a chance to go back to Willa Jean! I was really hoping to try their froze – I know, I’m that basic. In addition to being a great sit-down spot for brunch on the weekends, they have a take away section with a variety of pastries and the best coffee. Court of Two Sisters – this is another spot I didn’t get to try on this trip, but received so many recommendations for from my readers! I hear the Jazz Brunch on Sunday is out of this world! Cafe Du Monde – if you’ve never been to NOLA, you’ve got to make a stop at Cafe Du Monde for beignets. Although touristy, it’s totally worth it! Plus, it sits right on Jackson Square. Grab a bite and then go explore the many local artists, vendors and shops! 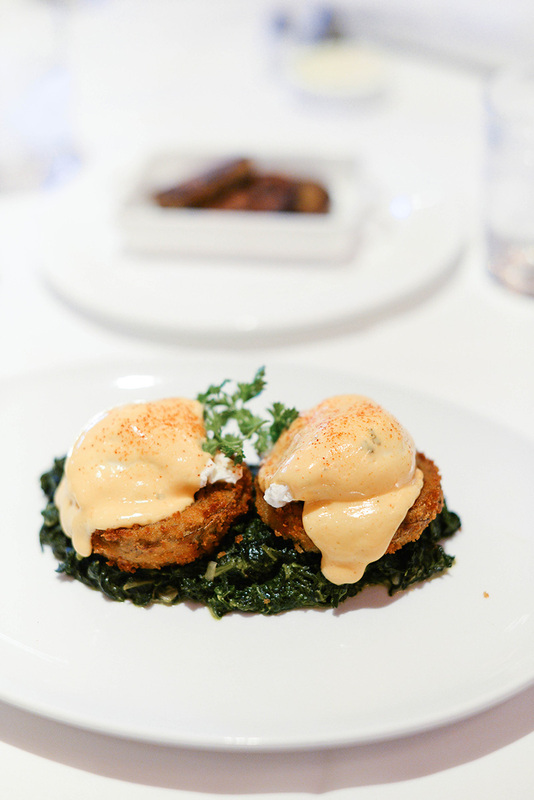 Brennan’s – for an upscale brunch in the heart of the French Quarter, make a reservation at Brennan’s. This historic gem is where Banana’s Foster and Eggs Benedict were born! The service is outstanding. I ordered the Eggs Sardou – incredible! Bonus: the building is pink and the inside is decked out with the most beautiful oyster plates. Definitely worthy of a photo or two! The Polo Lounge at Windsor Court – if you’re looking to grab drinks somewhere before or after dinner, pop in Windsor Court! This luxe hotel features a beautiful bar on the ground floor, but it’s The Polo Lounge you really want to see. La Petite Grocery – if you’re shopping along Magazine Street and want to pop in somewhere for lunch, try this darling spot. Housed in a small cottage that used to be a grocery store, this eatery features Louisiana fare with a foodie twist. Great place for a ladies lunch! Pat O’Brien’s – super touristy, but a New Orleans must if only for a Hurricane and the dueling pianos! Carousel Bar at Hotel Monteleone – Another great spot to grab drinks at before or after dinner is the Carousel Bar at Hotel Monteleone. The bar is truly shaped like a carousel – so fun! 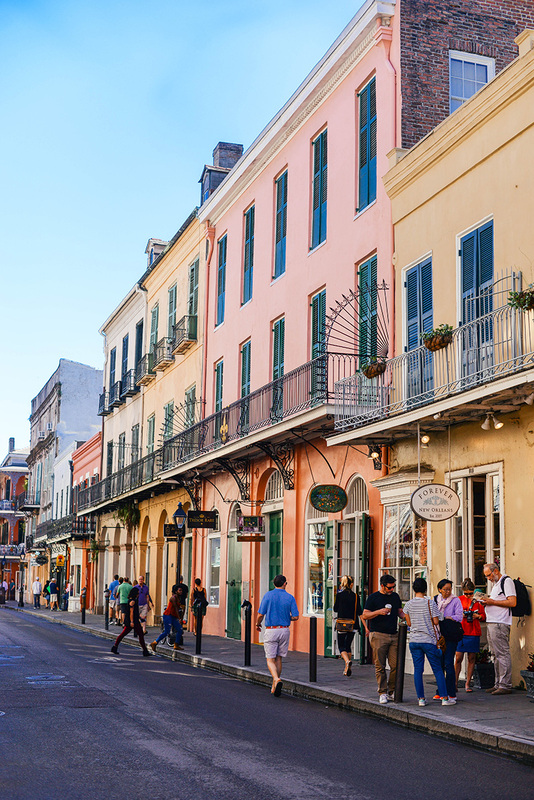 The hotel is right on Royal Street, so just a short walk away to a bunch of the restaurants listed above, and a block away from Bourbon Street. 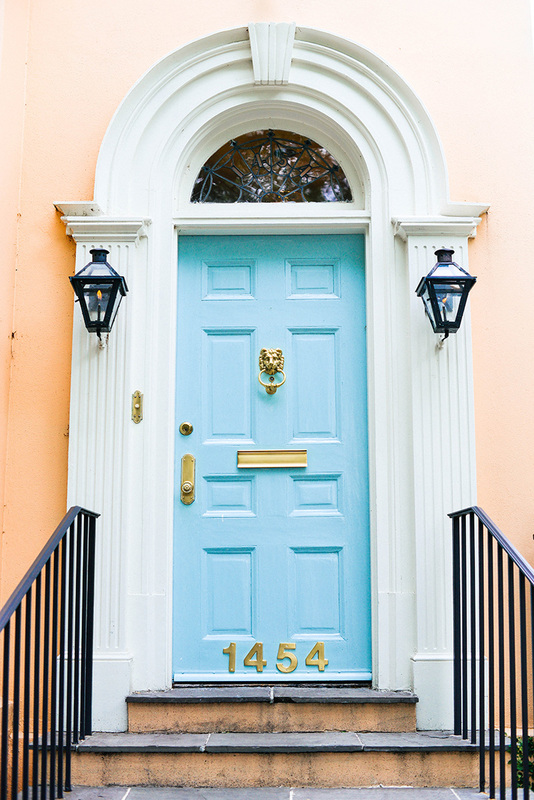 Magazine Street – this long stretch of road is home to dozens of fabulous antique/home decor shops and cute clothing boutiques! Plan your path in advance… my sister and I didn’t realize how long this street was and not everything is close to each other. Most of the clothing stores are on the same stretch of a few blocks, and most of the antique/home decor stores are on a different part of Magazine Street. Here are the ones I really liked! Rivers Spencer – if you love soft neutral interiors with a slightly modern touch, you will die over this store. I dragged my mom back here to show her, because I literally loved everything! Empire Antiques – if you’re looking to invest in some quality, impressive antiques, stop in Empire Antiques. So many beautiful armoires, hutches, tables, benches and more! You can actually shop some of their pieces on 1st Dibs too! Karla Katz Antiques – a great spot if you’re looking to invest in timeless, luxe antiques! Beautiful shop filled with all kinds of furniture. Shades of Blue – with vibe similar to Rivers Spencer, this smaller boutique features some truly gorgeous pieces of furniture, chandeliers, accents and more. The prices didn’t knock my socks off either, which is great! Perch – a really cute mix of furniture, decor and gifts. Cheeky doormats, luxe candles, bright printed pillows and more! 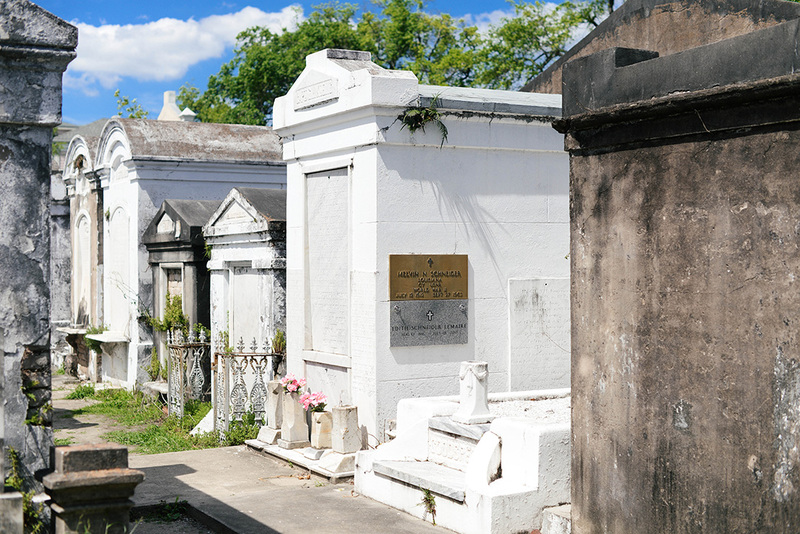 Garden District – if it’s a nice day out, have an Uber drop you off near Magazine Street and walk around the neighborhood. The homes are absolutely beautiful and oh so charming! 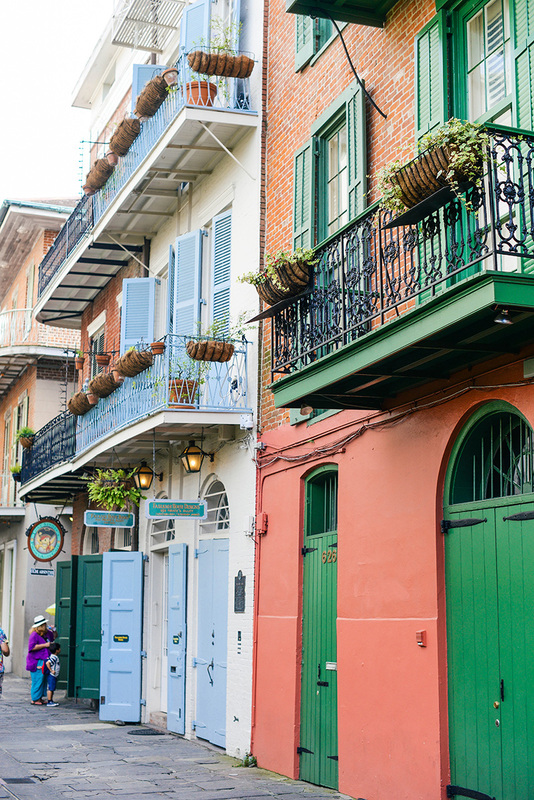 French Quarter – there’s a lot to discover in the French Quarter, particularly on Royal. Many an antique shop, great restaurants, and other stores with various gifts, knick-knacks and New Orleans gear to grab. 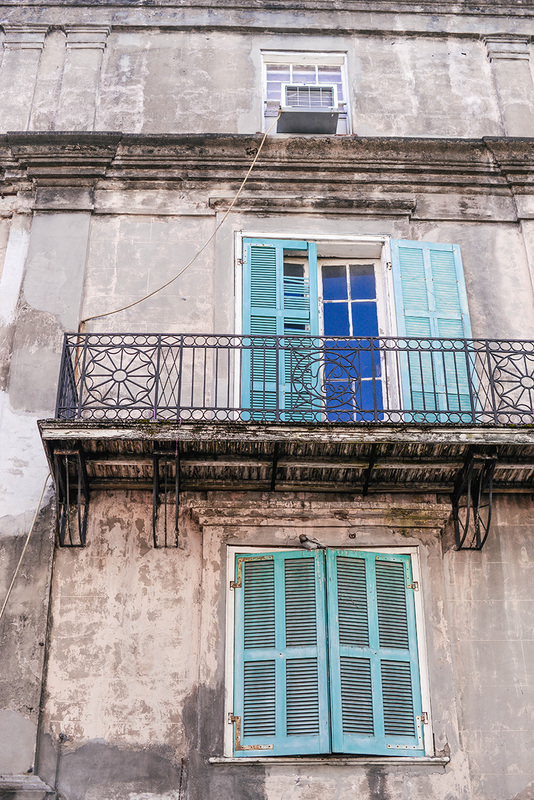 This is a great area for photos: colorful buildings, New Orleans-style balconies and beads, you name it. Be sure to check out Keil’s Antiques – three floors of fabulous pieces! 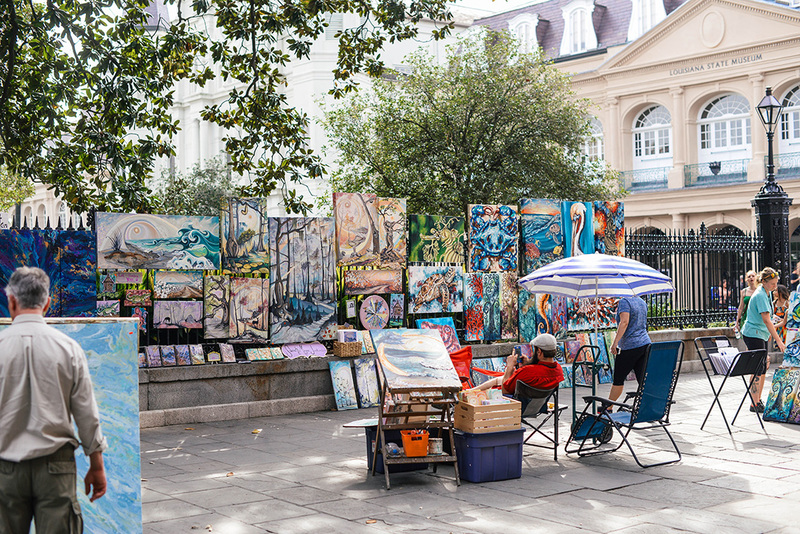 Jackson Square – in addition to a pretty park and outdoor space, Jackson Square is home to dozens of local artists and great little shops to explore. It’s a great place to find gifts or souvenirs if you’re hoping to score some before you leave! The National World War II Museum – visiting this museum is an absolute must on your next trip to New Orleans. Even if you’re not a history buff or have never known a veteran, you will love it! There are so many incredible stories, artifacts, and experiences within the museum! The Beyond All Boundaries movie they created is extremely powerful, so definitely make sure you buy tickets to that too. Bourbon Street – I did Bourbon Street in college and while fun, it’s not something I’d recommend doing alone or even with just a group of girls. Even during the day this area draws a seedy crowd (as does the rest of the French Quarter) and I wouldn’t say it’s the safest spot to meander while drinking. With that said, Bourbon Street can be super fun if you’re with a big group! Jazz, booze, etc. You get the drill. This is a wonderful guide!